Tailgating is one of our favorite fall traditions, and every year we make tasty tailgating cocktails! 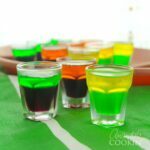 This year I thought it would be cool to do some team-inspired football jello shots. They’re portable, fun and get you in the tailgating spirit! 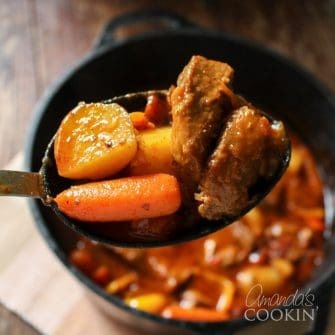 This is a sponsored post written by me on behalf of Ibotta®. All opinions are entirely my own. Content is for 21+ All offers were valid as of publishing date. Don’t forget to check your app for details as offers change frequently and may not be available in all areas. Fall can be a busy season for all of us, with a busy work season for many of us, lots of holidays, back to school, and all of the yard prep that goes into transitioning homes from summer to winter – it’s a miracle I see my family at all some months! But no matter how busy things get, we always try to get together for tailgating a couple times in the season. Everyone has their designated “category” – from dips to sliders – this year it was my turn for cocktails! 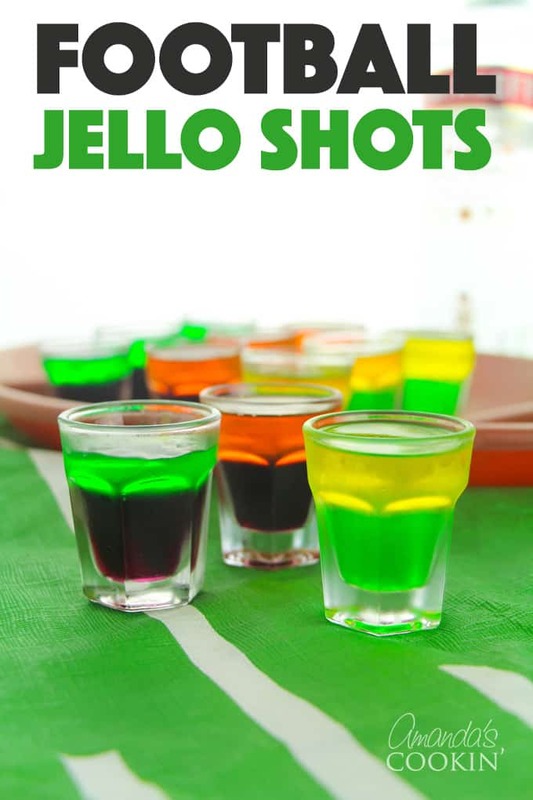 I love coming up with new tailgating cocktail recipes, and this year I thought it would be fun to make some Football Jello Shots! 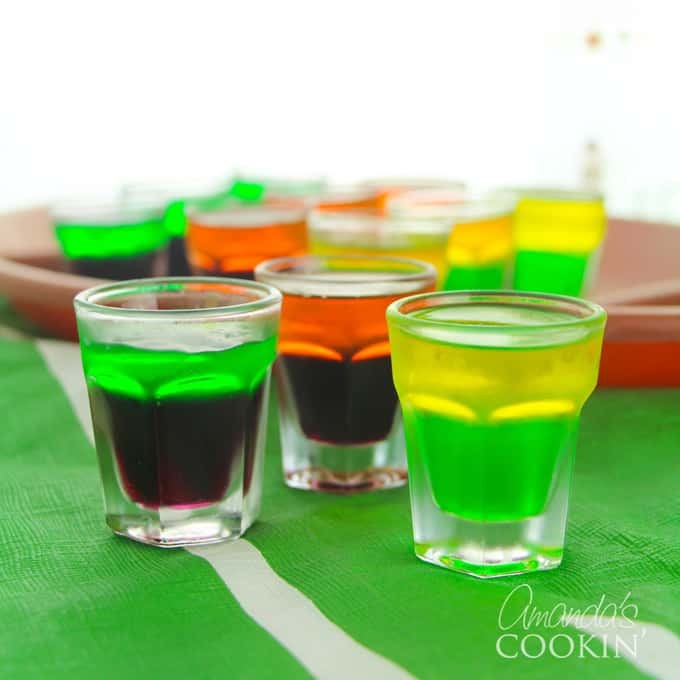 Jello shots are always a fun idea (even those who don’t usually like cocktails tend to like them) and the best part is that they can be prepared ahead of time and are super portable. 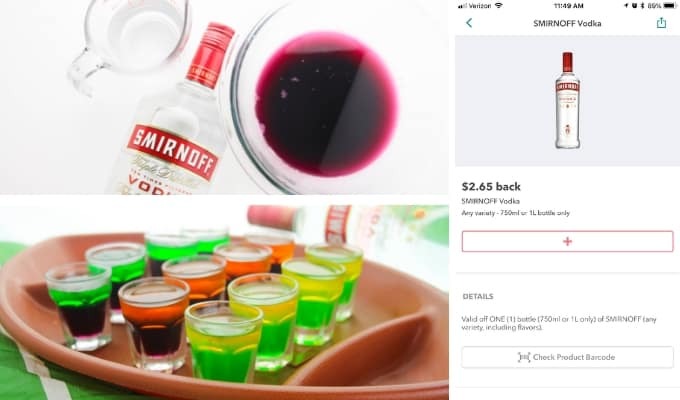 Of course, with the holidays coming up I wanted to save money where I could so I used the Ibotta app to earn cash back on my cocktail ingredients. I decided to pick up Smirnoff vodka for the jello shots and also a Bud Light 20-Pack for those that love their beer! If you’re new to Ibotta, it’s a cash back and rewards app that allows you to save time and money while shopping – whether online or in-store. There are always hundreds of products and cash back offers listed, so I just search whatever I am buying and I usually find at least a few of the items on Ibotta. 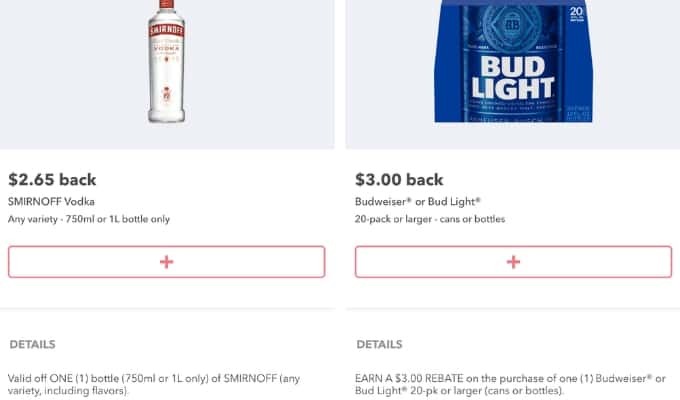 This time, I found the Smirnoff and the Bud Light on Ibotta, for cash back of $5.65! Those cash back offers really add up – I’ve made over $80 back in items that I’m already purchasing this month. 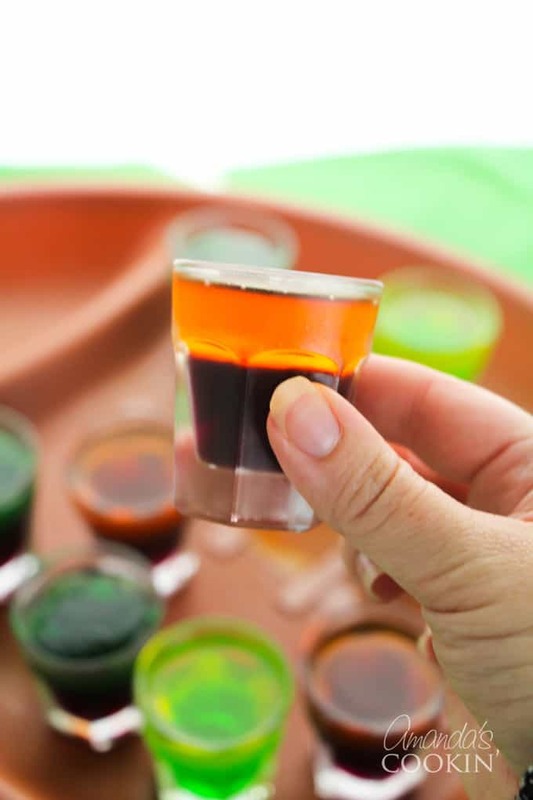 Glass shot glasses are great if you are tailgating at home, but using these shot glasses with lids (or you can use jumbo condiment containers) reduces the issues of glass while tailgating. Tip: I used 4 packs of jello to create a variety of team color combinations. It would be fun to coordinate the jello flavors to your family’s favorite team. Each box makes 10 shots. Boil the kettle for the boiling water. Place the jello in a small bowl or large measuring cup and dissolve with 1 cup boiling water. Stir well until jello is completely dissolved. Add 1 cup vodka and stir well. Pour the jello mixture into the shot glasses, filling halfway. Repeat with the second color of jello. What are your favorite tailgating traditions? Do you use the Ibotta app while shopping to receive cash back rewards? 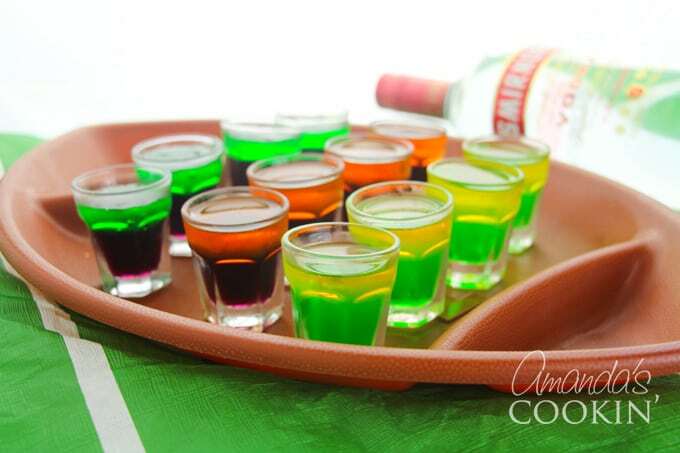 We love jello shots and have several others you might want to try! Our orange jello shots are made inside of real orange rinds, so fun for parties! 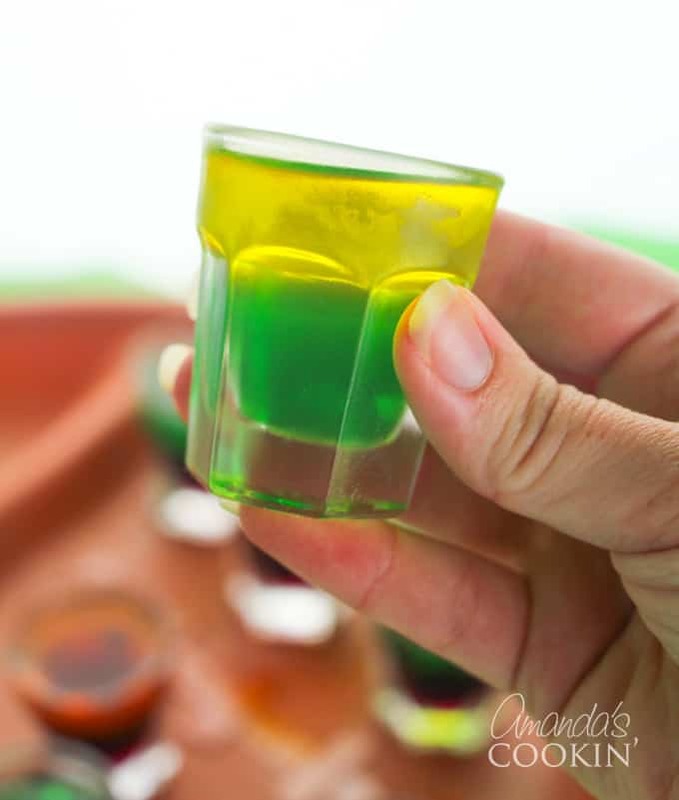 When St. Patrick’s Day rolls around, you’ll love these green jello shots. And for summer we have two types of watermelon jello shots! Love tailgating? 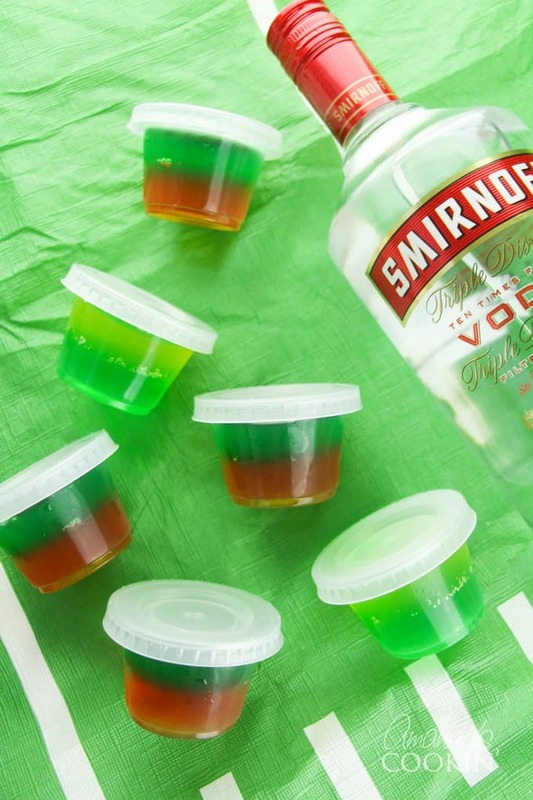 Portable football jello shots are perfect for it! 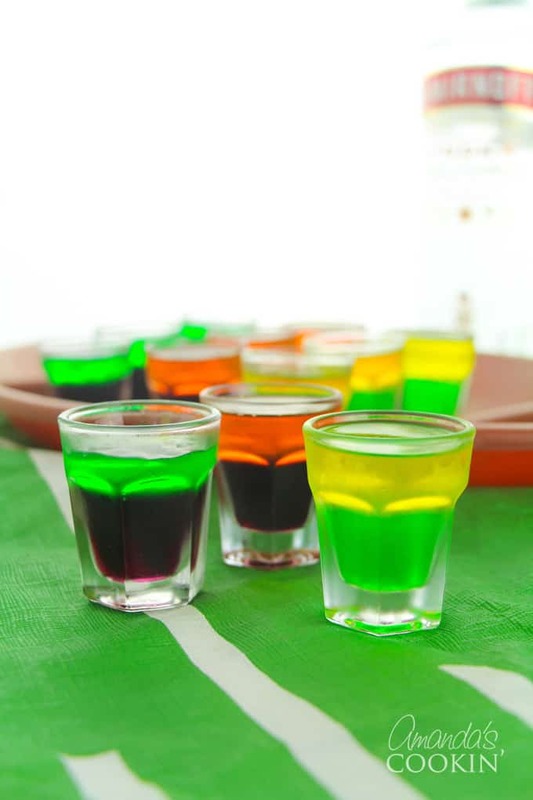 Watch the game at home or the stadium, these football jello shots are great! Repeat with the second color of Jell-O. These look like so much fun for game day. 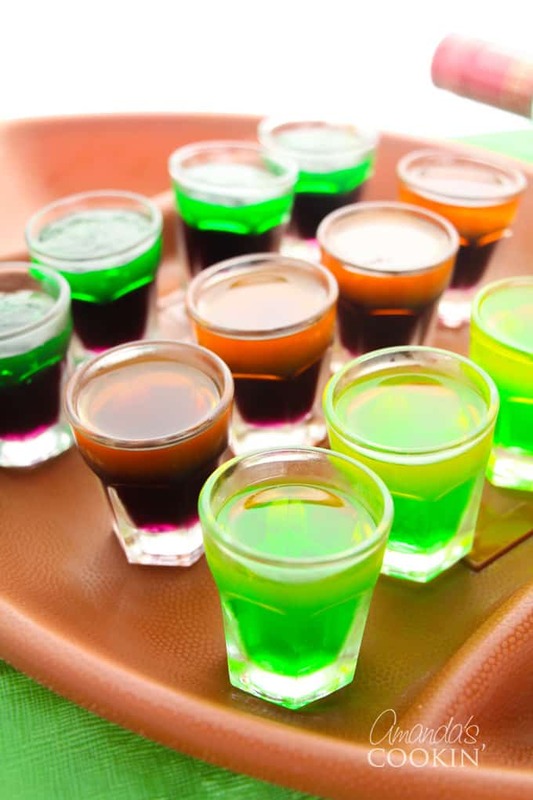 Who doesn’t love a great jello shot! Sounds like a party to me! what fun shots! so pretty too! Such a great idea for a tailgating or homegating party. 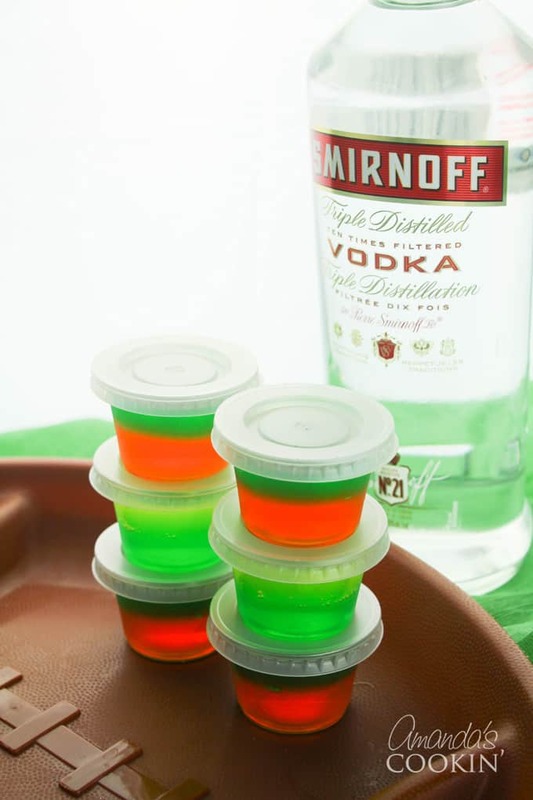 Oh, I am ALL about these Jell-O shots. Nom nom nom. I love that you can layer the colors for your favorite team, too. Mine NEVER come out right! Can’t try to make these!